Armed with rosaries, women from the Monica’s Journey support group walked into the chapel at St. Joseph Church in Ponchatoula on the first Friday of Lent ready to do battle. They were embarking on a 24-hour prayer vigil aimed at saving the souls of their children and others’ who have fallen away from their faith or are engaged in a battle with their own personal demons. St. Joseph parishioner Kathy Clark came up with the idea for an overnight prayer vigil after Father Anthony Odiong, pastor at St. Anthony of Padua Church in Luling, challenged the faithful attending a healing service to give up one night for their children. “So, we brought it to Monica’s Journey and I was just looking for someone to come pray with me and obviously the Lord wants it because it turned into this,” said Clark as she sat in the chapel preparing for a night of prayer. The evening kicked off at 6 p.m. with Stations of the Cross in the church, which was followed by Benediction of the Blessed Sacrament in the chapel. Fernando Morales, a member of the music ministry at St. Joseph, then led the faithful into the night of prayer with “Word and Worship,” which included prayer and contemporary Christian music. 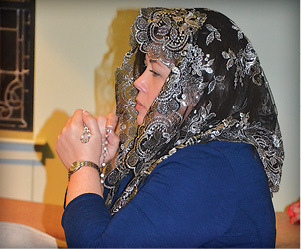 At 8 p.m., Dr. Sandra Jones led the rosary, starting off with the Joyful Mysteries. The Chaplet of St. Monica marked the 9 p.m. hour and each subsequent hour throughout the night was designated by other prayers; including rosaries, the Divine Mercy Chaplet, Stations of the Cross and the Divine Office of Morning Prayer. Also on hand were Marian Servants of the Visitation who prayed with those seeking extra spiritual help. The format was inspired by another retreat attended by Monica’s Journey members. 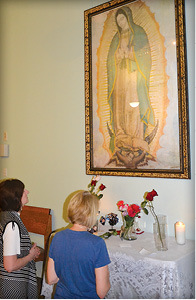 Each rose, representing a child, is placed before an image of Our Lady of Guadalupe for the prayer vigil. Monica’s Journey, a support group for women from broken families, started at St. Joseph four years ago. The ministry, which maintains strict privacy rules for safety and personal reasons, was the brainchild of Leslie Gardner, who developed the idea for a women’s support group following a retreat. Gardner’s focus was women facing issues such as broken marriages, problems with children, problems with parents and abusive relationships. She named the ministry in honor of St. Monica, who spent 17 years praying for her wayward son when he finally converted to Christianity and after death was canonized as St. Augustine, viewed as one of the most important church fathers. After gathering materials and formulating a game plan, Gardner met with St. Joseph pastor Father Paul McDuffie about the new ministry. 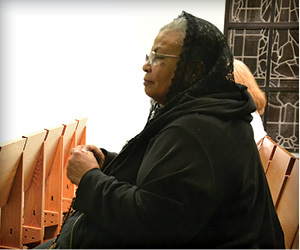 After more prayer and discernment, Gardner held the first meeting of Monica’s Journey on March 26, 2015. Four years later, the women in Monica’s Journey are keeping a vigil for their own children. 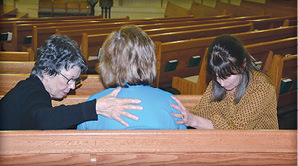 Joan Bly, left, and Tricia Jarett, members of Marian Servants of the Visitation, help lead prayer with an attendee of the prayer vigil, which was held on the first Friday of Lent. Dr. Sandra Jones leads the rosary in the chapel during the vigil. Leslie Gardner, founder of Monica’s Journey ministry at St. Joseph Church, prays in the chapel during Adoration of the Blessed Sacrament. 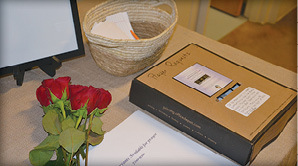 A box for prayer requests sits on a table in front of the chapel at St. Joseph’s Church in Ponchatoula. 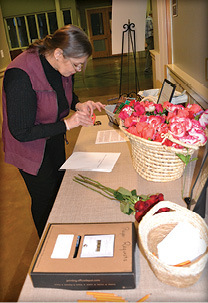 Members of Monica’s Journey held a 24-hour prayer vigil on March 8 to pray for children.